Elfin is an elf-like Bakugan with a frog head on top of her normal head who is Marucho's Guardian Bakugan in Bakugan: New Vestroia. Elfin can change her Attribute to gain an advantage during battle. She protects the Bakugan in the forest from the Vexos. She can shoot arrows out of her fingers. In ball form it resembles Preyas. 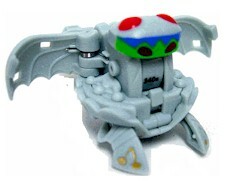 Elfin was released in all Attributes as a G power and Attribute Change Bakugan. Purchase Season 2 Bakuneon Elfin from Amazon now!